The world famous Joe’s Beer house Restaurant in Windhoek, which over the years have become almost mandatory on many a tourist’s visit to Namibia, also received a visit by a two and half metre long black mamba. 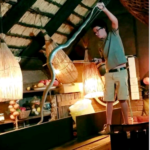 The huge snake was discovered by a staff member in the beams of the thatched roof over the restaurant area on Saturday and Francois Theart, a local snake wrangler, was called to the scene to remove the reptile. According to Theart the popular restaurant was relatively quiet and not many patrons was about when the snake was discovered. 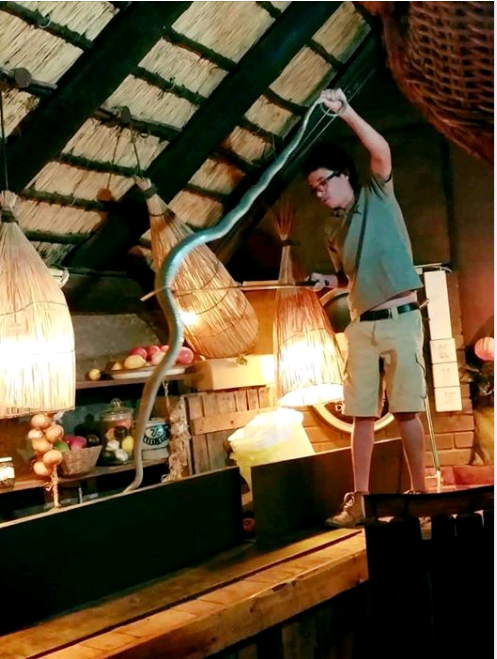 “When I got there the snake was curled up and resting on top of one of the roof beams under the big thatched roof at the back of the restaurant area. It was very calm and catching it went smoothly,” Theart said. He said the only difficulty he had was in reaching the snake in the roof beams above his head. The snake measured in at 2, 47 metres before it was released back into the veldt on the outskirts of Windhoek. A video of the huge snake being released back into the wild will be posted on Informanté’s Facebook page.